Retroanaconda had the most liked content! After discussions with some engineering-type people their recommendations were to do as Al suggests in the last part of the above post and pour the ‘walls’ in concrete which will form the foundation with the slab. Something like this: The depth of the walls/foundations can be as required for the soil conditions, however having dug out and poured a new base for the oil tank this weekend I can safely say that the ground is pretty hard with a fair bit of rock/slate in it. I can also add rebar to increase their strength if required, though I doubt this will be necessary. I’ll be able to do it in two pours which will have the benefit of making the logistics easier and also allowing me to properly compact the type 1 up against the well set walls and lay a DPM on top. The outer shuttering for the walls will be over height by the depth of the slab and remain in place until the final pour is done, with the inner shuttering being removed when the type 1 is set in place. Sorry, I meant the tool kit. I have one with the timing pins and it has a round tool which doubles as a crank pulley puller and the holding tool that lets you remove the FIP without disturbing the timing belt. The timing kits you can get for about £40 include a crank pulley puller. Thanks. I'm aware of the risk of uneven settlement over the width however as you say really this is limited to the edges. It's likely that there will be a width of 8" or so at the most of backfilled sub-base at the interior of the walls, and with the weight of the structure itself sat on the blockwork rather than the slab I think the risk is minimal. The undisturbed ground in the centre will be excavated to allow for the depth of compacted sub-base and the concrete itself but should provide good support underneath. I'm not entirely sure yet what the ground is like, the whole area was once slate quarries so there may be all sorts under the ground. Some trial pits will help with the design I am sure. 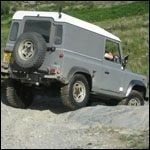 As for the strength of the walls, you're right in that structural engineering advice is not best sought from a Land Rover forum. However we do have a lot of members with experience of this sort of thing so there's no harm in asking. I'll chat with some engineering coleagues at work, but as the height of the 'wall' is going to be so small (less than a foot unsupported) I think the side loads will be minimal, both during compaction, pouring, and the static load of the slab. Using the wider hollow concrete blocks, with rebar reinforcement tied into the trench foundation, would be a belt-and-braces approach. In all likelihood the standard 100mm blocks would suffice. I’ve been looking at the site and thinking about the base today. There is a slope towards the rear corner of the garden, which is part of a general slope backwards along the plot. I’d like to have the workshop floor level higher than the ground in order that I can have a small flat (ish) area in front of the doors. This lead me to consider the method of doing the floor slab - building up off the ground rather than digging down into it too far. Also has the advantage of reducing the amount of spoil that requires relocating. The floor needs to be at least 100mm thick, with reinforcement at half the depth. And I want a good 150mm of compacted sub base underneath, plus the blinding sand and DPM. Due to the slight slope I wondered if it would work if I were to dig a trench foundation around the building footprint and put concrete in it. Then build a wall up to the finished floor height all the way around. Excavate interior to required depth, add sub base and blinding then pour a slab up to finished wall height within the blockwork walls. Something like the sketch below (slope exaggerated and blinding omitted for clarity). Is there any reason why this would not work? My only concern is the blockwork wall on the bottom side resisting any side load from the compacted sub base and concrete slab within. It will also be more work to build than just laying out a sub base and pouring into a timber formwork. To be fair, Defenders came out of the factory with an option for a 65 amp alternator which uses a single V-belt with no issues. Replaced the gear knob in my 90 a while ago with a genuine parts one. No issues so far. You could glue the insert back in with some epoxy resin, would be rock solid then. I made the barn style doors for the last one, ledged and braced with proper tenon joints. They were very strong and didn’t drop a millimetre in four years. But I think because of the site constraints any side opening door design is less suitable than a vertically opening option. Most roller shutter doors seem to be able to be fitted in either face-fit or reveal-fit positions. Reveal fit loses you less space in the building but narrows your door by a few inches either side. Less of a problem if the door is 3m wide! The front face of the building will be at least 4 metres wide, so a nice wide door is no issue as long as I can accommodate the ‘roll’ above the opening without compromising the roof pitch. Thanks guys. If I go with the roller shutter then I'd like the roller on the inside of the building just because it makes it look less 'commercial'. I'll be getting planning regardless because I need to go closer than a metre to the boundary with the high bit of the building (rear gable end), so height is not a problem so long as I don't go silly. The walls will be around 2.4m to the eaves, so I hope there will be space to tuck the roller up on the inside of the front gable. Good idea on the differentially-sized doors - though it still robs me of a few inches of width on the right hand door that won't be able to open all the way. The advantage of a roller or sectional door is that I can have a 3 metre opening which gives me loads of room on both sides of the car, useful when it's half-in or half-out of the building for some reason. There will definitely be a conduit laid from the house into the slab for power etc. - the previous effort had a 40 amp supply using a 10mm² armoured cable and I will try and replicate that here as it worked well. As far as heating is concerned I am hoping that with insulation the building will be fairly easy to heat to a comfortable temperature. The previous building wasn't insulated at all and even that was never too cold once I'd had a little fan heater going for 20 minutes. Could be worth a call to Airtex themselves, see if they are willing to confirm whether they still make them or not? That would certainly work and does look good, the only downside is that it limits headroom for a longer section of the building. The roller needs more space vertically but only for 18" or so in from the door. More of an issue for storage of things than anything else, as the vehicle would have to fit under it anyway. How do they compare cost wise do you know? Mine is a big S, then four smaller numbers followed by a zero. There’s enough space around the place yes. I can’t bring it any further forwards because the central heating boiler is on that corner and the flue needs space to vent into. I never had a problem with the length of the previous building, 6 metres is comfortable. Width was always the challenge, compounded by big bits like engines/bulkheads/doors which all had to be stored down one side. I’m hoping that with those out of the way even the previous width of 4 metres will be sufficient, but if I can squeeze another foot or so in then I’ll try and do so. I may look into a covered car port down the side of the house in the future, which would give me an extra covered area in front of the workshop. But it’s tight width wise. Having moved house I want to build myself a new workshop and happily there is some space in the garden which should allow me to do so. I built one at the previous house which served me very well however there were a number of issues that bothered me about it. Mainly the slight slope on the floor, but also its susceptibility to mice ingress and the fact that I didn’t insulate it. I will hopefully address these issues in the new build. I am a bit more limited with space this time but there should be room for a building about the same size as before - 6 metres long and 4 metres wide. Here is where it will go, with the rough footprint marked out (yes the oil tank needs moved first!). The main challenge is proximity to the house, and the fact that vehicle access is down the side of it. This means that normal side-opening doors are not suitable as shown below. Fitting side-opening doors would mean that I would both lose aperture width because they would only be able to open part of the way, and the left hand one would also block off the path past the edge of the house. For these reasons I will probably go with a roller shutter door, enabling maximum opening size without causing any obstructions. The vehicle doors will be offset in order to line up with the access route, this shouldn’t cause a problem as the vehicle needs to sit off-centre in the building anyway because of the workbench etc. which will go down one side. Good use of shelving etc. will hopefully help to keep the floor area as clear as possible. The building will be much the same construction as the previous one, with a few enhancements. Principally amongst which will be a brick plinth a few courses high on which the walls will sit. This should help keep mice out as well as prevent any issues with damp. The walls will also be insulated and boarded on the inside. Roof too if I can figure out a sensible way of doing it. More to follow soon hopefully. First step is to move the oil tank, then I can speak with the neighbours, get planning permission sorted and with any luck get started. It’s there isn’t it? I can see something stamped. Mine is in that location.